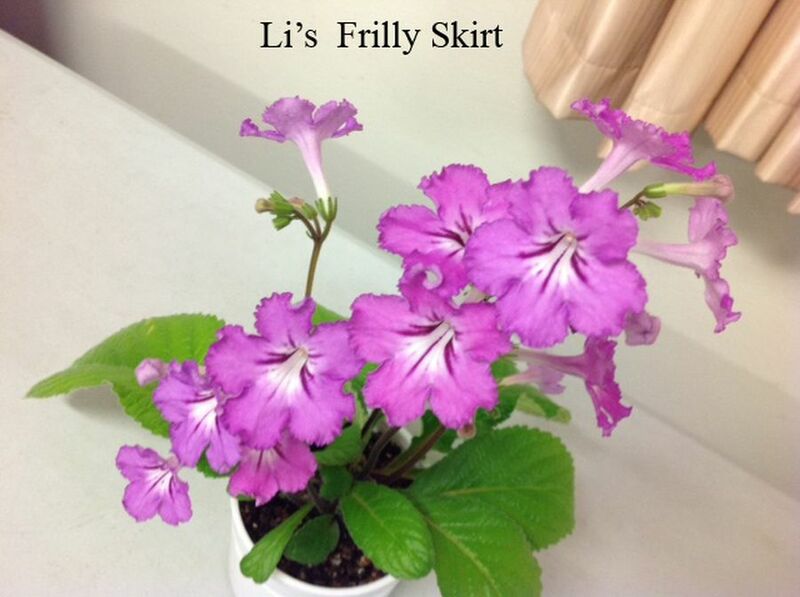 Streptocarpus ‘Li’s Frilly Skirt’, 2017, IR171372, hybridized by Andy Kuang, Australia. (S. ’Cricky’ x S. cyanandrus). Cross made 03/12/2010, planted 03/11/2011, and first flowered 02/02/2012. Fertile, reproducible only vegetatively. Basal rosette, approximate size 150mm tall x 160mm wide, stem length 30mm. Leaves green,120mm long, 60mm wide, with 20mm petiole, linear with cuneate base, serrate margin and acute tip. Calyx split, green, 5mm long. Pedicel 5mm long with 6-8 flowers per axil. Corolla salverform, 40mm long, 30mm wide, pink with frilled edge with red lines on the throat.